This Demonstration analyzes square regions of the image using a 2D cellular automata (CA) rule. To prove there is no cheating, you are given control over where the textures begin and end. Click a region to analyze it and mouse over the square to see if the CA thinks it is in the circle. 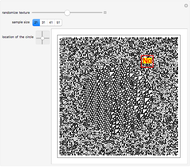 This is a biologically inspired machine vision scheme, designed to broadly mimic the human primary visual cortex using five-neighbor 2D cellular automata. If the sample region (where is odd) is evaluated times, the center cell on the final image gives the "answer" of which texture is present in the sample region. This came out of a research project done at the 2008 NKS Summer School (NKS|Online). 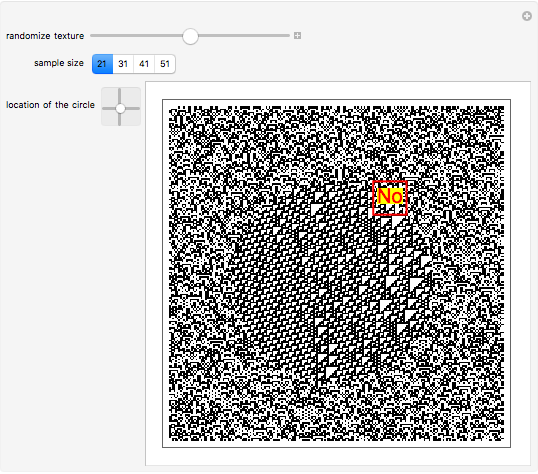 Rob Lockhart "2D Cellular Automata for Texture Recognition"